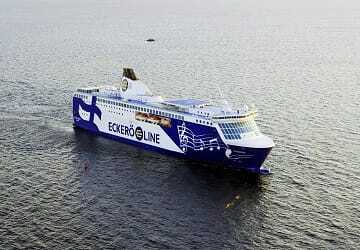 Eckerö Line operates ferry crossings between Finland and Estonia, on the popular Helsinki-Tallinn route, across the Gulf of Finland. Part of the Rederiaktiebolaget Eckero Group, Eckero Line was founded in 1995 to meet the demands of a quick route between Finland and Estonia. Making the journey in just over two hours, Eckero Line’s M/S Finlandia maintains a friendly and cosy atmosphere on-board, having earned its name from almost twelve thousand customer suggestions. Coloured in Finnish blue and white, M/S Finlandia boasts six restaurants, two shops and conference facilities, while the capacity for passengers reaches two thousand, and it can hold six hundred and fifty vehicles. The entirety of Eckero Group complies with strict environmental standards, and M/S Finlandia is one of the pioneering vessels. Using low sulphur fuel and energy-efficient bulbs for the spotlights, it also collects waste heat from the engines, utilising it in the cooling systems during summer, leaving little trace in the Baltic Sea. Directferries.co.uk provides an impartial ferry comparison service allowing you to view numerous ferry company timetables and fares in one quick and easy search. Compare Eckerö Line timetables and prices now with all alternative ferry operators before booking your ferry ticket.